Doha, QATAR – Qatar Airways Group Chief Executive, His Excellency Mr. Akbar Al Baker, hosted a press conference in the airline’s hub today at the Premium Terminal of Doha International Airport, to a crowd of more than 150 international media, who had travelled to Qatar to view the first A350 XWB, for which the airline is the global launch customer. Also in attendance at the press conference were Mr. Didier Evrard, Airbus Executive Vice President Head of Programmes and Mr. Eric Schulz, Rolls-Royce President of Civil Large Engines, both of whom previously attended the official delivery of the aircraft from Airbus to Qatar Airways at a ceremony held in December at the Airbus Delivery Centre in Toulouse. 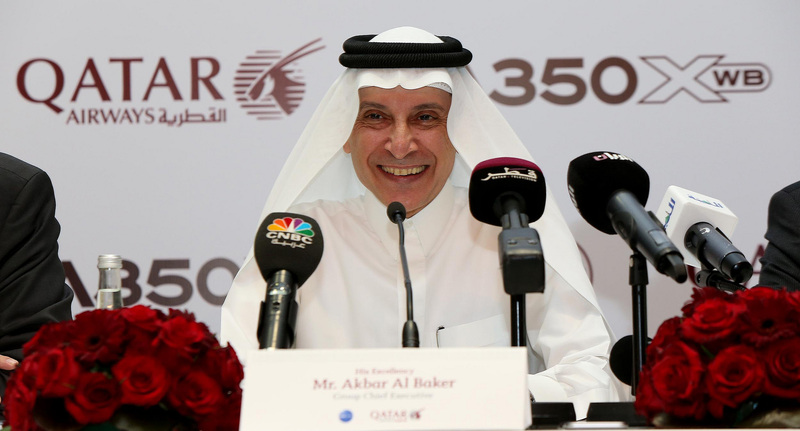 Qatar Airways Group Chief Executive, His Excellency Mr. Akbar Al Baker, said: “We are ready to commence operations with the A350 XWB and are delighted to introduce another level of service with our expanded fleet. Following the press conference, media were given the opportunity to meet with the airline’s Group Chief Executive, before continuing to tour the newly inducted aircraft. As global launch customer for the A350 XWB, Qatar Airways will be the only airline to fly this aircraft type for the foreseeable future, and was a significant contributor to its cutting-edge design in partnership with aircraft manufacturer, Airbus, and engine manufacturer, Rolls-Royce. The first commercial service will be deployed on the Doha-Frankfurt route – a sold-out service – on January 15, 2015. The A350 XWB will comprise a two-class configuration with 36 Business Class seats in a 1-2-1 configuration, featuring 80” fully flat beds and 17” HD in-flight entertainment screens. Economy Class will comprise of 247 seats, each 18-inches wide in a 3-3-3 configuration, with up to a 32-inch pitch. Each individual seat will feature a 10.6” in-flight entertainment screen, and more space at shoulder level for passengers in window seats, thanks to a vertical side wall panel design. Over 70 percent of the A350 XWB’s weight-efficient airframe is made from advanced materials combining composites (53 percent), titanium and advanced aluminium alloys. The aircraft’s innovative all-new carbon fibre reinforced plastic fuselage results in lower fuel burn as well as easier maintenance. Qatar Airways is the only airline in the world to operate every family of Airbus’ modern airline portfolio. In addition to the 80 A350s it has on order, the airline has a current Airbus fleet comprising of the A320, A330 Freighter, A319LR, A321, A330, A340 and A380 families.